In India, We all are familiar with massor dal (red lentil). Especially in north India, This is very popular recipe. But as we know, to make Dal, we uses lots of spices for specially in tadka. But as I tried to give it a turkish touch, this red lentil soup is made with very less spices still it tastes so good that no need to give tadka to this masoor dal recipe. I am always eager to learn new cuisines and I have tried lots of recipes from Italian, Mexican and Chinese cuisine. The mixed mean soup is best Mexican dish from all my trials of Mexican cuisine. But the idea behind this recipe is only one person. It’s not me, yaa, his name is chef VIKAS KHANNA. I am huge fan of him. His TV show based on Turkish Cuisine inspired me to learn new dishes from Turkey. I learned that, in turkey people are using red lentil very much (though mostly Turkish dishes are non-vegetarian). I am also new to use red lentil (masoor dal). But, there is a will , there is a way. 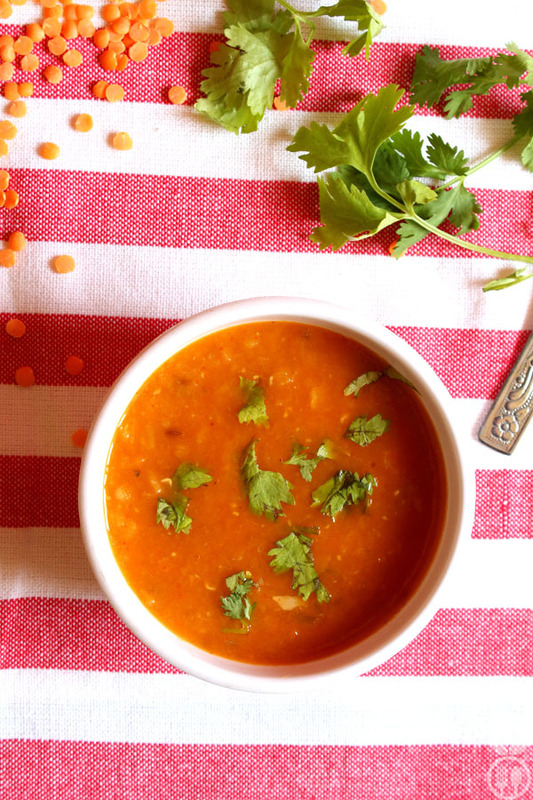 I created this super healthy and delicious vegetarian lentil soup in place of very ordinary masoor tadka dal recipe. The very important ingredients of this recipe are Oilve Oil and Bay Leaf. Without these two ingredients, you may loose the dominant flavor of Turkish cuisine. One interesting thing, I found about this recipe is red lentils take less time to cook compared to other lentils. 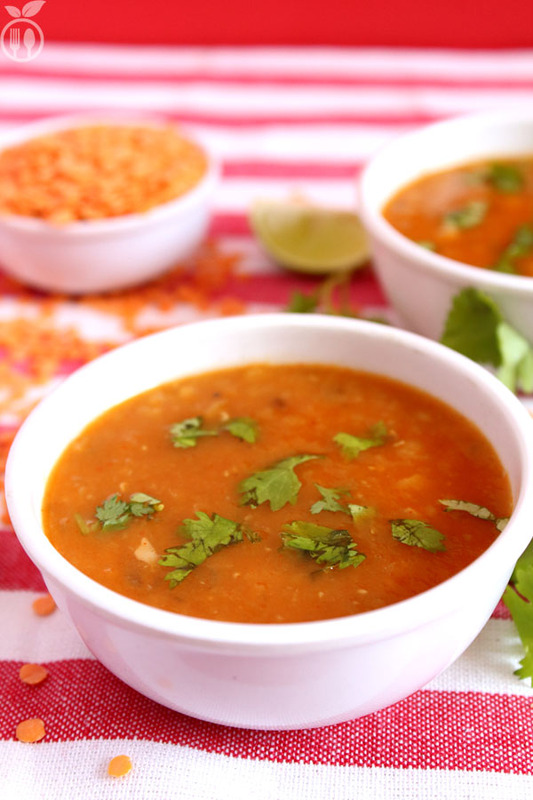 We always boil the lentil first and then give spicy tadka to the recipe. But this Masoor Dal recipe is so easy and quick. It hardly takes 20 minutes to cook and it’s all made in one pot. No socking. No pre-cooking. Add some hunk of bread/crackers + some vegetables (like carrot, spinich, tomato) and you have complete meal spending less time in kitchen. Olive oil and Bay leaf both ingredients are must for this recipe. You can use soaked red lentils, it will take less time to cook. But if you forget to soak it, don’t worry, it will take some more time to cook. You can also replace red chili powder with paprika or cayenne powder. You can also add carrot and spinach in this soup. you have to add these both ingredients with onions. Once the soup is ready, take 1-2 cups of soup into blender and grind till smooth. and again add it into soup. This process is totally optional. But it will give a nice (restaurant like) texture to your soup. 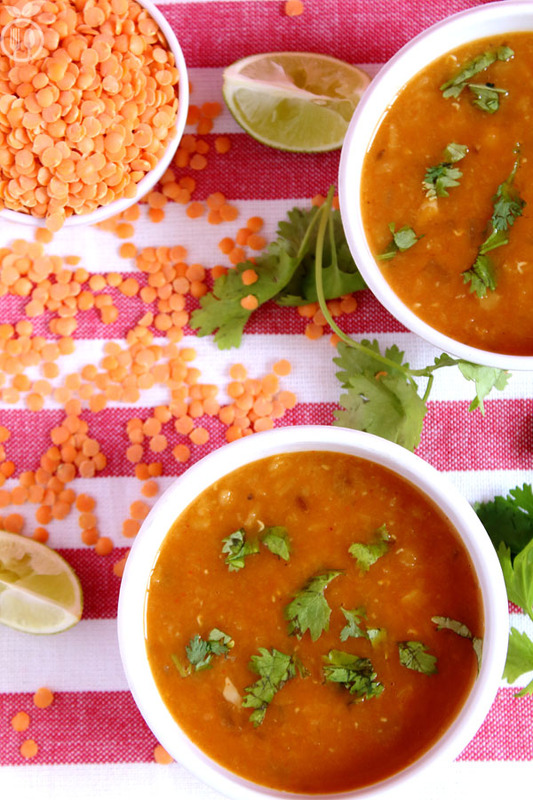 Vegan Red Lentil Curry Soup is called Masoor Dal Recipe in India. I have tried to make this vegan turkish red lentil soup by two important ingredients Oilve Oil and Bay Leaf. Warm the olive oil in a large pot over medium heat. You have to use olive oil in this recipe, 2 tablespoons olive oil may seem like a lot, but it adds a lovely richness and heartiness to this nutritious soup. Once oil is simmering, add cumin seed, bay leaves and let them pop. Add onion, stirring often till onion is turning translucent. It will take around 5 minutes. Then add garlic and red chili powder and give a nice stir. Add socked red lentil and water. The amount of water depends on red lentil quantity. I have used 1 and ½ cup lentil so double water is required. So add 3 cup of water. And cover the pot with lid, and cook for 15 minutes. Then open the lid, add salt to taste and black pepper (optional) and cook for another 5 minutes. Then transfer the 1 cup of soup to blender. Be careful with your hand from steam, puree the soup until smooth. Again transfer the puree of soup back to pot and give a nice stir and just cook for 1-2 minutes. Remove from the gas and add 1 tbsp tomato ketchup. serve as hot and garnish with fresh coriander leaves. 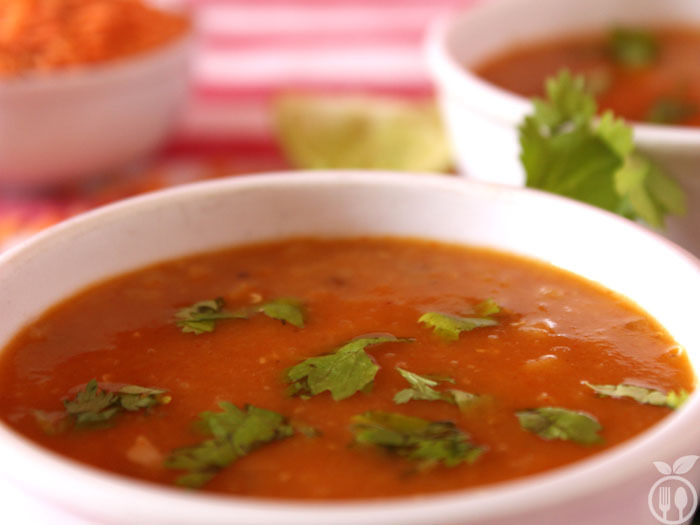 you can also add finely chopped carrot and green peas with this soup.